Barnie's Blend Office Coffee. 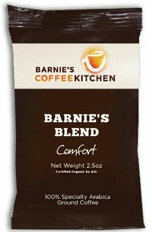 Barnie's signature blend coffee is a blend of South and Central American coffee. A well rounded coffee that is sweet, balanced and full bodied. Each case contains 24 bags with 2.5 oz coffee. This may be the perfect office coffee for your Atlanta based workforce. Barnie's Quality. Well known coffee in the south. Each case contains 24 bags with 2.5 oz coffee. Note: Barnie's Coffee and Tea is going through a logo change. This is the same Barnie's Coffee that we all know and love.